This is the latest addition to my excessive nail varnish collection and has been added thanks to my lovely friend Hannah, who is a good friend from university and came to visit the big smoke on Saturday. In amongst the tapas and cocktails, I spotted this colour adorning Hannah’s fingernails and immediately wanted it. I have a real weakness for anything that could be said to fall within the coral family so this was perfect. The colour is very pretty, bright, but not too bright, part coral, part pink and perfect for a sunny spring. After spotting it on Hannah, I insisted she text me the name of the shade when she got home and the next day I headed off to Superdrug to pick up my own bottle. I do love the colour and for a price of around £3.50 I really shouldn’t complain – but the formula of Rimmel 60 Second Nail Varnish really is quite poor. I have mentioned this before when I picked up the shade ‘Euphoria’ – the claims of a one-coat, fast dry polish are just plain false. I did two coats for the pictures above and think it could do with a third and my nails didn’t dry any quicker than a normal polish. The only thing other than the colour that I would say I like is the brush – which is wide so coats the whole nail in a single (or single and a half) coat. So basically, it’s a lovely colour – shame about the formula though. 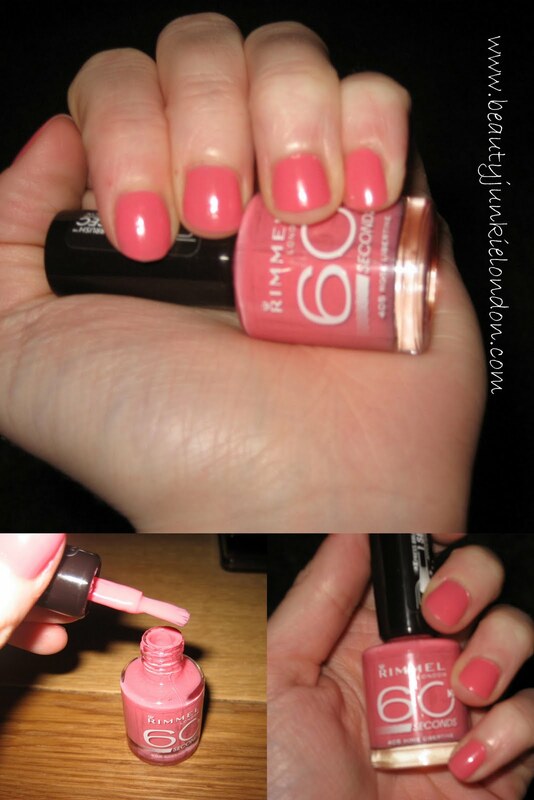 What do you think of Rimmel nail polishes?? Yay or Nay?? I bought this myself. In a shop. With real money. Previous Post Golden Touch Facial at Neville Salon, Belgravia. Hi there – I totally love this colour and blogged it this morning 🙂 Although I have to say your camera has picked up on the coral better than mine – it seems to look more pink in my pics. I do love Rimmel polishes and for the price you cant argue – but I did need 3 coats!!! if you like it, do follow me! Shame about the formula, the colour does look nice – very Betty Draper from Mad Men – in fact you do remind me of her! Maybe you can do a Betty FOTD?! I love the Rimmel PRO range, not so much the 60 second one. Rimmel PROs have wide, kind of ‘fanned-out’ brushes and the formula is really nice, most of them are almost opaque in one coat. Definitely recommended! I have recently reviewed one colour from that range, Beige Style, which is GORGEOUS, very in keeping with the ‘mannequin hands’ trend, but I think it’s got more pizzazz than all other colours of this kind! I was looking at this today and managed to resist it. Will probably end up going back and getting it tomorrow, the colour looks so gorgeous I think I could cope with the rubbish formula! I always find them a bit hit and miss! They do some great colours but they don’t seem to last as long as other brands and go super gloopy REALLY quick! It’s a 50/50 yay nay from moi! I’ve found the 60 second nail varnishes work fine in darker colours – my dark brown dries really quick and one coat manages fine. Not so great for spring/summer though, the lighter polishes will probably need more… am also a big fan of the wider brush. It really is a gorgeous colour – had lots of compliments on it since the weekend. It hasn’t really chipped either, but it has worn quite badly at the tip. It would be good to find a better quality version of this colour if anyone knows of one…! Wooow. I love this color. I’m going to get this today. Come check out my blog. Love the color, unfortunately I haven’t had any luck finding the pretty shade in the states. 🙁 Does anyone know of any look-a-likes? Wow.. what a amazing colors. i love all this colors. and most the last three.Which is so cute. I like those very much. I tested the “deliciously dark” and it’s so poor. Bad formula, takes at least 10 minutes to dry and you need two coats. And it doesn’t even last more than two days. Sorry, but for me it’s a no no. It is my great pleasure to visit your website and to enjoy your excellent post. Keep on posting and thanks for sharing this information. The colors perfectly blend with the rest of the style.